Square 8: Puzzling excuse number 128: It doesn't represent autistic people! 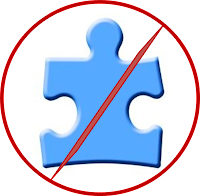 Puzzling excuse number 128: It doesn't represent autistic people! It comes with the look halfway between perplexed and pitying. Because how could I not get it? And yet how could I, supposedly lacking Theory of Mind and understanding of symbolic language? It comes with an edge to the voice and the slightest roll of the eye. The puzzle piece, she explains, slowly, pointedly, as to an errant child, stands for the mystery of autism! Not autistic people, but how we still don't know what causes it! And because it stands for what causes me to be me, well, obviously I shouldn't be offended. I try to explain that autism is not, cannot be, separate from the person, using the points Jim Sinclair outlined here. But then I look again. On her lapel is the most famous of all puzzle pieces. Of course I've seen it thousands of times, but I have to check, just in case I've been mistaken. Nope, it's still the same. A puzzle piece shape in bright blue with legs, arms, and a shrunken little head. I'm pretty sure this is a person. Am I the only one who sees it? And while the Autism Speaks logo might not be the original autism puzzle piece, it is certainly the most recognizable. It represents a person, and despite my history of pareidolia there is no way you are going to convince me otherwise. This has been cross-posted to unpuzzled.net. Please visit Unpuzzled to read more about the autism puzzle piece symbol. > and I just had another thought while browsing the autism shirts... about the reason why the autism 'puzzle' thing bugs me. So glad to know I'm not the only one who's noticed this! Codeman38, I'm glad to hear someone else say this, thank you. Littlewolf, Squawk! Thank you, it is good to be back! For me there has never been a doubt that the puzzle piece was intended to resemble a human body. That fact, for me, contributes to the repugnancy of symbol. Advocacy? Advocacy for whom, I wonder? For those neurotypical people who want to champion their plighted - having been saddled with another human being who does not see the world as they do? I find it to be a curious twist that the symbol intended to depict an enigmatic 'broken person' actually has an abstract symbol containing and entire body. What constitutes 'complete'? It's good to see you back—and yes, that puzzle piece is pretty suspiciously person-shaped, isn't it? To me that puzzle piece makes me think of as though a piece of the puzzle was missing, implying that those who are autistic are missing an integral part, have a screw loose or missing, that we are not "whole". Perhaps this is so, looking at it from an NT construct, where the puzzle has four sides and four corners. But from my perspective, ok, yes, perhaps I may have a puzzle piece missing here and there, but what about the extra puzzle pieces that info have that shape me differently than the four sides and four corners. Don't those other puzzle pieces make up for the ones that are said to be missing? Seemingly not under the rigid constructs of an NT world.